The tanker market has been positively surprising shipowners and investors so far this year, and 2015 is turning out to be the best year for this segment of shipping in a long while;, since 2008, to be accurate. It’s hard to fathom that just this time last year, VLCCs and Suezmaxes were barely touching $25,000 pd in the spot market, while nowadays these very types of vessels almost reach thricely the levels of last year. Strong freight rates are always welcoming news, no doubt. On the other hand, an investor has to look forward and trying to decipher present trends that would matter in the future. One of the noticeable things of the present tanker market is that while freight rates are strong, asset prices have not improved correspondingly. Typically when freight rates are very strong, asset prices, with a short lag, typically follow the market higher: everybody wants to buy in a hot market, and the lucky owners for ‘hot’ tonnage are looking for a premium to part company with their vessels. However, in the present market, asset prices – at least for certain segments of the market – have not improved. Is this an omen of changing trends in the market, a new paradigm, or indicative of a market where ‘hotness’ has not been given proper consideration, for the right or wrong reasons. Owned by a private equity fund, tanker MT ‘Orwell’ Image Credit: Karatzas Photographie Maritime. In a previous article we mentioned the volatility smile, where ‘middle aged’ tonnage seems to be completely out of favor, and thus comparatively undervalued. And we can ignore the market of 15+ year-old tankers, as this is a market with its own dynamics. However, modern tonnage, allegedly the sexiest tonnage of all, has not behaving too strongly either. Typically, Wall Street analysts love modern tonnage given that vessel daily opex is lower for modern vessels and visibility of earnings are a tad better, and thus the positive bias from financial buyers for modern tonnage; on the other hand, cash-rich buyers of vessels with access to terminals and end users only pay lip service and show incrementally little interest for modern tonnage at full price – they would rather buy into a value proposition rather into sexiness. Accordingly, a great deal of sale and purchase transactions have been concentrated at the opposing ends of the spectrum leaving for a gap in the middle. The VLCC market has been fairly active with Euronav (ticker: $EURN) acquiring four VLCC resales from Greece’s Metrostar at $98 mil each with options for additional tonnage (N/B Hyundai HI (Gunsan) Hull Nos 2725, 2726, 2727, 2728, 300,000 dwt and deliveries 2015 and 2016). Tsakos Energy Navigation also acquired two resales from US-based private equity fund two VLCCs (300,000 dwt, Hyundai Samho Hull Nos S779 and S780 with 2016 delivery) at $97 mil each. Shinyo International after a long respise has been active again in their favorite sector with the acquisition of three modern VLCC tankers MT ‘New Founder’, MT ‘New Medal’ and MT ‘New Coral’ (297,500 dwt, Shanghai Jiangnan Changxing Sb/China, 2008/2009/2010, respectively) at $245 million. Greek reference account Thenamaris has acquired MT ‘DS Vidonia’ (306,000 dwt, Daewoo, 2006) from DS Shipping at $57.5 million. Ridgebury Tankers based in the USA have acquired four older VLCCs MT ‘Pioneer’, MT ‘Progress’, MT ‘Pride’ and MT ‘British Purpose’ from Windsor Petroleum (1999/2000/2000/2000, 306,000 dwt, Samsung Heavy) at $150 mil, which amount was from equity freshly sourced from the buyers. While the age of the tonnage may rise eyebrows for financial buyers, it’s worth noting that Ridgebury were already the managers of the vessels and the sale of the vessels via the control of the bondholders after Windsor Petroleum went out of business. In the Suezmax tanker market, AMPTC has reported sold MT ‘Zallaq’ (153,000 dwt, Hyundai Heavy I., 2001) at $23 mil to clients of Avin in Greece; it is understood that the vessel is due drydocking in the second half of this year, which partially explains the softer-than-expected pricing. It is reported that US-based private equity fund CarVal Investors has sold Resale Hull No N/B New Times SB Jingjiang 0315819 (155,000 dwt, New Times, 2016) to clients of Dynacom Tankers in Greece at $59 million; it seems that the sellers have ordered this vessel, alone, in January this year at $65 mil, and less than six months later have sold at almost 10% loss; a change of heart, unless the ordering of a Suezmax tanker was their ‘option’ to enter into this market segment. On older tonnage, Vista Shipping has sold their Suezmax tanker MT ‘Pride’ (150,000 dwt, Mitsui Shipbuilding, 1993) at a scrap related pricing of $12.5 mil. The aframax tanker market seems to be the market segment in the crude tanker market which has least benefited from the present surge in freight rates, and it has shown the least market activity, comparatively speaking. China seems to be replacing the US as the major, solid buyer of crude oil in the international markets since the emergence of shale oil, and transporting oil to China in Aframax tankers is not as cost efficient as using larger tankers. In the middle of June, Blue Lines Shipping has sold the oddly-sized Aframax tanker MT ‘BLS Advance’ (85,000 dwt, Sasebo, 2002) at appr. $20 mil to clients of Greece-based Avin International. Similarly aged MT ‘Kuban’ (106,000 dwt, NKK Corp, 2002) was sold by Novorossiysk Shpg. to Soechi Lines in Indonesia at just excess of $17 mil. It’s worth noting that Soechi Lines bought a similar vessel in many respects (size, shipbuilder pedigree, etc) MT ‘Hellespont Tatina’ (105,000 dwt, Sumitomo S.B., 1999) in September 2003 at below $10 mil, and less than two years later, asset pricing in the segment has proven many a buyer right. The still Japanese-built aframax tanker MT ‘Texas Star’ (115,000 dwt, Sanoyas, 2003) was sold by Atlas Maritime in Greece to Yinson Holdings in Malaysia at $28 mil; it had been reported at the time that this tanker then named MT ‘Herm’ was bought by Atlas Maritime in November 2012 at just excess $18 mil, representing a nice asset play transaction for the company. 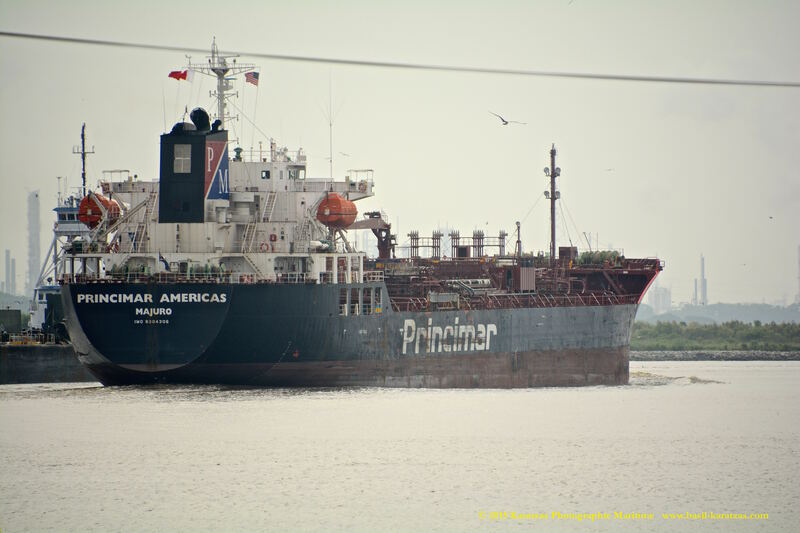 Tanker ‘Princimar Americas’, evocatively named, downstream the Houston Ship Channel. Image credit: Karatzas Photographie Maritime. The tanker market had been weak for quite a few number of years, with many shipowners trading spot in the sector having reached the limits of their tolerance. Now that the market has turned around, there is renewed interest in the sector; some of such activity was to be anticipated as pent-up ‘demand’. However, while still the interest is mostly centered around modern tonnage and M&A activity, a perfunctory review of the transactions mentioned in this report clearly points for the sectors with greatest potential: ‘sexiest’ segment of the moment doesn’t make most profitable trade. Probably, ‘think counter-cyclically’ is a good starting point when pondering shipping! This entry was posted in Crude Oil Tankers, S&P Update and tagged Atlas Maritime, Avin International, Euronav, Gener8, Soechi Lines, Vista Shipping, VLLC by Karatzas Marine Advisors & Co.. Bookmark the permalink. 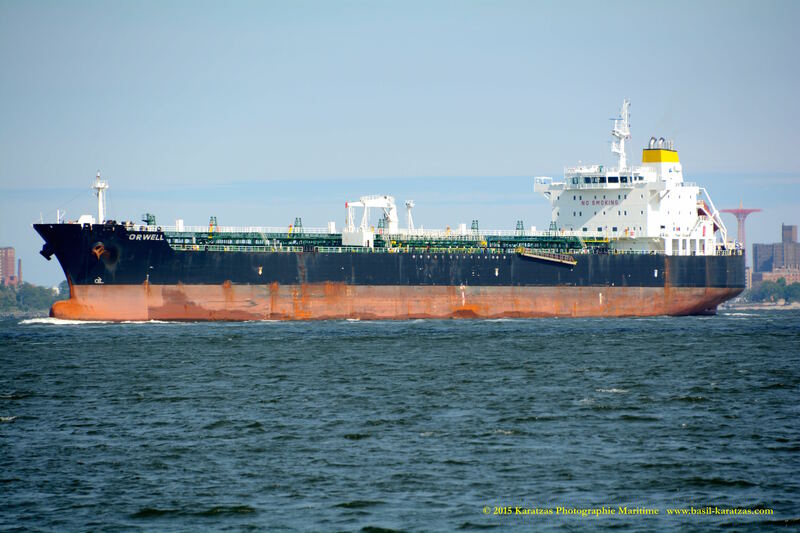 Karatzas Marine Advisors & Co. posted: “Tankers: Think Counter-cyclically!